Our Diamondback Gulch Tour brings the Arizona high country to life with a rugged off-road adventure. Step into one of our open-air Pink® Jeep® Wranglers and buckle up – you’re about to see why this tour offers something for everyone. After arriving in Coconino National Forest, you’ll head down the rugged and remote Greasy Spoon trail. A section of the original wagon route between Sedona and Prescott, this century-old trail stretches back to an era before Arizona was a state. Catch glimpses of a colorful past when the cliffs, canyons and forests were wild, uncharted territory and 50,000 Texas longhorn cattle roamed the land. 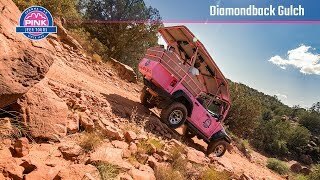 Finally, an easy ride from the forest back to Sedona will give you plenty of time to catch your breath, steady your feet and plan your next off-road adventure with Pink® Jeep® Tours. The Gulch tour was just a bumpy ride without interesting rock formations. Disappointing for the cost. Exciting and interesting. It made my birthday trip that much more memorable. My niece and nephew came to town for a short trip. First time off road in a jeep. We saw grand canyon, sunset crater and they said the Pink Jeep tour was the best part of vacation. I thought it was really fun too. Guide was great with kids, took pictures of our group, stopped for us to see a snake slithering by. It was a fun experience.....no regrets that it was how a big portion of our day in Sedona was spent. The tour was a great way to see parts of Sedona we wouldn’t have otherwise seen or experience them in a completely different way! Our guides knowledge of the area and everything we encountered on our tour was a huge added bonus.